Earned Value Management (EVM) is a method for measuring a project’s performance. Earned Value Management is a complex task of controlling and adjusting the baseline project schedule during execution, taking into account project scope, timed delivery and total project budget. . The method is useful during execution of a project because it tells us where we are going with schedule and costs, indicating any variance to plan. Figure 1. The project triangle: Scope, Time and Cost. An important part of successful project management is to have accurate and reliable information and the current performance is the best indicator of future performance. By using trend data, it is therefore possible to forecast cost and schedule overruns early in the project. The Earned Value Management method was introduced in the 1960s as a financial analysis specialty in United States Government programs, but has since been a significant branch of project management. In the late 1980s and early 1990s, it was no longer used by EVM specialists only. The EVM was emerged as a project management methodology to be understood and used by managers and executives also, and today EVM has become an essential part of project tracking in many projects. The method can be used to measure the real progress of a project, and combines the measurements of the project management triangle: scope, time and cost. Thereby the EVM method provides early indications of expected project results based on project performance and highlights the possible need for corrective action. These indications become available to management as early as 20 percent into the project . First of all, to implement the Earned Value method it requires that a Work Breakdown Structure (WBS) must be built by decomposing all the work to be done in work packages. These work packages are the smallest groupings of work tasks which are necessary for the level of control needed. Material, labor and other resources are allocated to each work package, and a schedule of all the work packages are set up. .
With the EVM method we can measure the expected total project time and cost and calculate the deviation between the current performance and the planned performance. The method uses some basic EVM metrics, which will be introduced. This is the time-phased budget baseline. It is the approved budget for accomplishing the activity or work related to the schedule. PV can be viewed as the value to be earned as a function of project work accomplishments up to a given point in time. The total PV is equal to the Budget at Completion (BAC). This is the total budget baseline. It is the highest value of PV and the last point on the cumulative PV curve. The graph of cumulative PV is often referred to as the S-curve, because it (almost) looks like the letter S. The reason for this 'S' shape is that it is flatter at the beginning and at the end, and steeper in the middle, which is typical of most projects. This is the cumulative actual cost spent to a given point in time to accomplish an activity or work (and to earn the related value). In Figure 2 the three key parameters are shown together with the Budget of Completion (BAC). 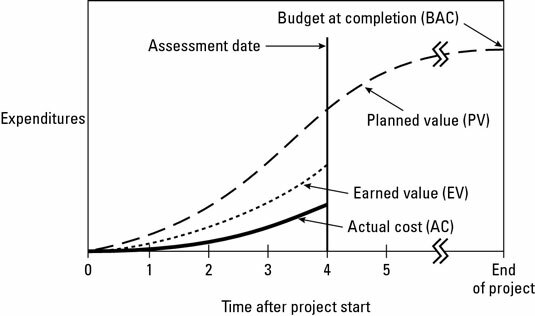 From this figure it is seen that the Earned Value (EV) is below Budget of Completion (BAC), which means that a project is delayed. Moreover, the figure shows that Actual Cost (AC) is below both BAC and EV. This means that a project is under budget. There exist four different possible time/cost scenarios, which can be seen on Figure 3. Scenario 1: The project is late and over budget. Scenario 2: The project is late but under budget. Scenario 3: The project is early, but over budget. Scenario 4: The project is early and under budget. The Planned Value as of the status date is PV = $50.000, but the Actual Cost is AC = $60.000 and the Earned Value is EV = $40.000. This means that the project is over budget and delayed. This example can be seen on Figure 4. By comparing the three key parameters, PV, AC and EV, it is possible to determine the cost performance and schedule performance. The variances are based on cumulative data (also called inception-to-date data and project-to-date data). The Cost Variance (CV) is the difference between the Earned Value (EV) and the Actual Cost (AC), i.e. a measure of budgetary conformance of actual cost of work performed. In other word, CV indicates how much over or under budget the project is. The Schedule Variance (SV) is the difference between the Earned Value (EV) and the Planned Value (PV), i.e. a measure of the conformance of actual progress to the schedule. So in other words, SV indicates how much ahead or behind schedule a project is running. If we build on the example mentioned above, we can calculate the cost variance and the schedule variance. The CV and SV for this example are shown in Figure 5. The performance indices are ratios, which say something about the efficiency. The Cost Performance Index (CPI) is the ratio of Earned Value (EV) to the Actual Cost (AC), i.e. a measure of budgetary conformance of Actual Cost of work performed. The Schedule Performance Index (SPI) is the ratio of Earned Value (EV) to the Planned Value (PV), i.e. a measure of the conformance of actual progress to the schedule. The SPI provides information about schedule performance of the project. It is the efficiency of the time utilized on the project. The product of the Cost Performance Index (CPI) and the Schedule Performance Index (SPI) is called the cost-schedule index, or the Critical Ratio (CR). This ratio is an indicator of the overall project health, and it informs you of how much you are getting out of each dollar spent on the project. A ratio equal 1.0 indicates that performance is efficient and on target. A ratio greater than 1.0 indicates excellent, highly efficient performance. A ratio less than 1.0 indicates poor, inefficient performance. From theses indices we see that both the CPI and SPI are less than 1.0, which indicates that we are a little behind schedule and a lot over budget, which is illustrated on Figure 6. It is said that bad news known at the 20% point in a project’s life cycle gives an opportunity to take corrective actions. Therefore, project managers are primarily concerned with decisions affecting the future, as forecasting and predictions are very important aspects of project management. The EVM is designed to keep an eye of the project performance and to give management an important “early warning” signal to take corrective actions in the future. EVM is especially useful in forecasting the total project cost and time to completion, based on the actual performance up to a given point in the project. The method is used when the variances at the current stage (or until now) are typical, for example due to some unforeseen conditions which are likely to happen at the beginning of a project, but are not expected to occur in the future. This method is used when past estimating assumptions are not valid and new estimates are applied to the project. This could for example be if you are behind schedule or over budget. Where ETC is the Estimate to Complete. Here we assume that the future variances and performance will be the same as the past variances and performance, i.e. the CPI will remain the same for the rest of the project. The example is build on the previous examples. This means that if the project continues to progress with CPI = 0.67 to the end, the project will at completion have costed $149.000. Figure 7. Traditional Project Cost Management vs. EVM. There is a fundamental distinction between using a traditional cost control approach and the Earned Value management. In traditional project cost management the plan-versus-actual cost comparison gives no way to ascertain how much of the physical work that has been accomplished. Such displays merely represent the relationship of what was planned to be spent versus the funds actually spent. If we take a look at the example which has been used through the article and look at the cost performance in top of Figure 7, it indicates great results against the original spending plan, where the planned funds are equal to the actual costs. This is only useful as a reflection of whether a project has stayed within the funds authorized by management, i.e. funding performance. This does not reflect the actual cost performance. Even though the EVM method is very useful, it has some limitations too. Earned Value as a technique is effective in the management of projects, but has very limited utility in the management of continuous business operations. Therefore it should only be used on projects – preferable on small and simple projects, as large projects has many components which have to be accounted for which can derail in the details. Another crucial aspect is that the EVM method does only consider time and cost, but not the quality. Quality is such an important part of any project, that it is necessary to have some kind of quality control. Without that, it means that a project can be on budget and time, but still be a very bad product. Overall, it is also important to remember that the EVM does not tell the whole story, and therefore is the method not attended to be used as a stand-alone tool. Moreover, the Earned Value Management method requires that the project scope, schedule and budget is well-defined. The Earned Value Management method may be a waste of time, if the proejct's goals and outcomes are vague and if the Work Breakdown Structure (WBS) is incomplete. ↑ 1.0 1.1 1.2 Measuring Time: Improving Project Performance Using Earned Value Management (2009), Vanhoucke, M.
↑ 4.0 4.1 4.2 4.3 Earned Value Project Management Method and Extensions (2003), Anbari, F.